Claims episcopal succession from Saint Patrick. Established as a state church in 1536 under King Henry VIII. Disestablished in 1871 under Queen Victoria. The seat of the Church of Ireland is at Saint Patrick's Cathedral in Armagh. 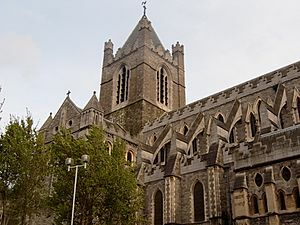 Today the Church has roughly 390,000 members throughout Ireland, which makes it the second largest religious community in Ireland (after the Catholic Church) and the third largest in Northern Ireland (after the Catholic Church and the Presbyterian Church in Ireland. Church of Ireland Facts for Kids. Kiddle Encyclopedia.